Barbara Rose Thomas Wheeler was born 12-05-35 at the Hardburly Coal camp in Hardburly Kentucky to Gilbert Daniel Thomas and Nancy Bell (Noble) Thomas. 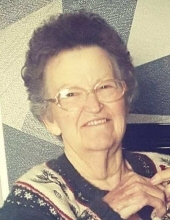 Barbara passed at the Rose City Villa 4-10-19 at the age of 83. She was married for 64 years to J.R. Wheeler in Kentucky, but they relocated for work and raised their family in Standish Michigan. Barbara, the mother of two children Glenn Paul (Cendy) Wheeler of Greenville S C. and Sandra Sue (Randy) Langley of West Branch Mi. " Barb" as most called her was a homemaker. She loved her grandchildren; Michelle, Martin, Glenn (Jen) 2nd Wheeler, Jennifer (Jason) Petty, Mick (Samantha) Petty and Travis (Sara) Petty, along with many grandchildren and great grandchildren. In her younger years she was an avid crochet blanket maker, along with other handmade items of sewing. She enjoyed fishing and camping with her family. Being she was married at a young age and spent most her life with her husband, she was at a loss for her partner when he passed 5 years ago. Our family believes as she did in Jesus, that she is now reunited with our Father, and her Mother whom she greatly missed as well as a great granddaughter, Jessica, and daughter in law, Linda, as well as many sisters; Lottie, Leona, Patricia, Judy, Jackie, Peggy, and two brothers, Sam and Gilbert Jr., whom were all pre deceased. She leaves behind her sister Linda Dybas of Pinconning, MI and a sister in law Patricia Walters of N.C. Along with Many nieces and nephews, her Son and Daughter and grandchildren and a special friend Jean Sanders. Funeral Services will be Friday, April 12, 2019 at 1:00 pm at the Lee Ramsay Funeral Home-STANDISH CHAPEL, Standish, Michigan with Pastor Paul Ruediger officiating and interment in Sterling Cemetery, Sterling, Michigan. The family will greet family and friends from 11:00 am Friday, April 12, 2019 till time of service at 1:00 pm. To send flowers or a remembrance gift to the family of Barbara Rose Wheeler, please visit our Tribute Store. "Email Address" would like to share the life celebration of Barbara Rose Wheeler. Click on the "link" to go to share a favorite memory or leave a condolence message for the family.